We're getting books every day. 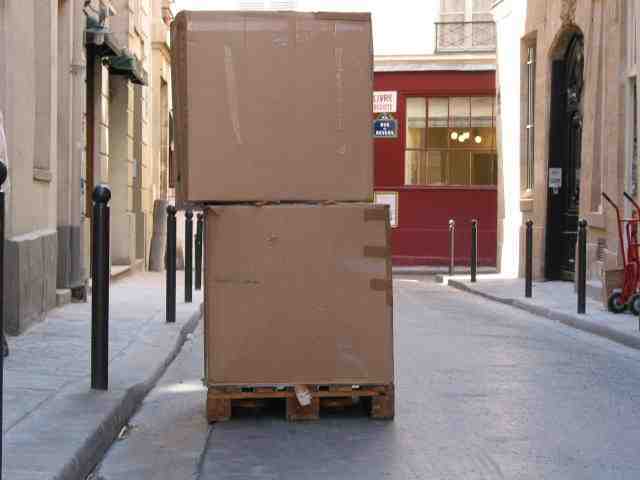 Here is a shipment blocking Rue des Nesles in Paris. A half a ton of Art, Architecture, Photography, Design and Literature from the Continent! Painter Jack Levine passed away at the age of 95 last November. His paintings can be found in the permanent collections of museums around the world. Abrams and Rizzoli published major books on his work. His publishers took ample advantage of his own writing; Jack was also a clever writer and impassioned contrarian. The quiet force of his intellect could be felt in everything he did. Mercer Street Books recently acquired his personal library, and we are displaying a large number of his book in a special "Jack Levine" section. We are presenting it as a mini-museum. You are free to come in and browse his collection. Each book is for sale. Most of the books are related to art, but others reflect the wide range of his interests. More of his books are put up each day. The intention is to give a feeling for the life of an important mid-century artist.